Today is the last day you can enter to win my favorite pancake griddle. It’s a Presto model that fits four large pancakes, or some smaller pancakes and two delicious strips of bacon. Or eggs. Or hash browns. Versatility is one of the things I love about my Presto griddle. And the fact that it doesn’t burn my pancakes. This griddle is worth about $50. Enter to win a Presto Griddle below. 1. Check out the griddle here. 2. Come back to this page and comment with how this griddle will help you and what you’d use it for. 3. One lucky winner (and two runner ups) will be selected Saturday, February 21, 2015 Friday, February 20, 2015 when the contest ends at 11:59 p.m. EST! Extended by one day because WordPress accidentally didn’t publish this reminder post on time. I made a quick video telling you why I love my Presto griddle so much. We can fit four large pancakes easily onto our griddle, or a couple of pancakes and stripes of bacon. We also use it to make a big batch of scrambled eggs – it can hold 8 eggs no prob. You wouldn’t believe how much toddlers can eat! It has a drip drawer to catch bacon grease, though you can also just put a dish under the hole. The griddle is slightly slanted so the grease runs off. The other thing I really, really like about my griddle is that it never burns pancakes. Set it to 325 and your pancakes will not burn -assuming you don’t leave them on five minutes. These babies cook QUICK! Start to finish, I can get pancakes on the table in 15 minutes. And 12 minutes of that is making the batter cause we make them from scratch. This is how we make pancakes every Saturday. Do the steps in order to minimize the screams of hungry children. Plug in griddle to 325. Cut 3 Tbsps of butter off the stick and place in a metal measuring cup. Place measuring cup on griddle to melt butter. Pour 1.5 cups of milk into a 2-cup measuring cup. Crack two eggs into the milk and stir. When butter is melted, stir it in. Now grab a large mixing bowl for the dry ingredients. Add 1 3/4 tsp baking powder. Stir dry ingredients together, then all at once add in your milk-eggs-butter combo. Stir until just all the big flour lumps are gone. It’s ok to leave some of the small lumps as they will dissolve. If you stir too much, the pancakes will get tough. This recipe doubles nicely. By this time, your griddle should be right at temperature, so pour 1/4 cup of batter on the griddle and put syrup on the table! We love griddle cooking! So much so that the non-stick coating is wearing off. Winning this would help by replacing it. We sautée vegetables in it. Asparagus is my favorite. I love that this is fold away. I have an old griddle but would love to replace it with this one. I love that you can set the temp. I would use this mostly for breakfast pancakes or french toast. There have been times that I have pulled mine out to use when I had to make a few Grilled Cheese sandwiches at the same time, works well for that also. thanks for the chance! it would allow me to not make pancakes in a frying pan. kids are 2 & 1 so i could make them faster which means less whining from my husband and kids waiting. I already have a larger Presto griddle and love it but due to its size I use only when we have company for breakfast/brunch. This would be perfect for our family of 3 (actually 4 since my Lab gets excited when she hears the word “pancake” LOL), We enjoy making a variety of pancakes and my daughter loves her Mickey Mouse silicone pancake mold. Thanks for the opportunity!!!!! What a great griddle, would love to have one! My family loves to make breakfast. We would love to have a griddle to make delicious pancakes. I don’t have a griddle; my pancake artistry is 2.5 pancake starts crammed into a fry pan. When all the kids come home for holidays, it is a longgggg process to create pancakes in the fry pan, and feed the hungry gang. THIS griddle would indeed change my life and change the spirit of Christmas morning (and others) with Less Stress for the chef (me) and joy and happiness for all those being fed pancakes quickly, efficiently and yummy!! Sigh, sounds awesome to me!! Thanks so much!! This griddle would feed a family of 4( myself and loved ones). I love making breakfast in the morning for everyone. They would be so excited to see me win this and experience the divineness of pancakes every day, yummers! This seems like to ideal appliance for a hot breakfast. Room for several pancakes or eggs. I like that it folds up for storage and it can be immersed to clean without the electrical plug. Would probably work well for crepes or mini pizzas. 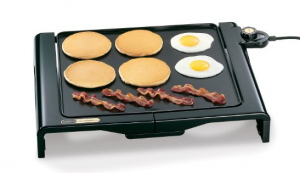 I’d love to make my kids works breakfast using the griddle. French Toast, tons of bacon and scrambled eggs! I would love this! My pancakes always burn! Would love to make beautiful pancakes and cheesy grilled cheese sandwiches. This is the same griddle my parents have that reminds me of Sunday morning chocolate chip pancakes made by my dad! I live in Manhattan now, far away from home, and I would LOVE to have a little piece of that memory here with me. I try cooking pancakes every weekend, but it’s just not the same. They don’t cool as evenly and golden brown as they do with a griddle. And, of course, a pancake griddle isn’t exactly in my new NYC budget! I love how much it can hold. I wouldn’t have to use multiple pans. And being so fast will keep the horde at bay! I would use this for breakfast items and might try to use for pork chops too. I like the compactness of this grill and that it is fully immersible when you take off the temp. control. I need a griddle since the one I had no longer works. I would love this griddle. I have the Presto cool touch and love it but one of the sides broke and I’ve been wanting to replace it. This would be great to have! French toast, chocolate chip pancakes, eggs….the possibilities are endless! I would love it! Such a time saver as I could cook all the breakfast at the same time. Easy cleanup and store away. Hi, my family loves pancakes, and this would be great to take on vacations with us. This griddle looks perfect for a small family. You can cook multiple foods (like eggs, sausage, bacon) at the same time on just one griddle. The fact that you can set the temperature assures that your food will always be perfect. I once had an electric frying pan with a temperature gage that I used all the time and I loved it. I’m sure this griddle will get used a lot! Right now my kitchen has been gut it. Husband has stop working on my kitchen. There wall are up with no mud. I have only slow cooker. As a college student with a small apartment kitchen, it would be nice to have a griddle to make myself a good breakfast, rather than eating a bowl of cereal or tasteless dining hall pancakes. It’s also nice that this griddle can hold 4 pancakes at a time which would make it easy to feed my roommates too. I would love to win this griddle. I love the fact that I could prepare everybody’s breakfast at once. Now, we eat our French Toast one or two at a time, as they come off our small griddle. I think it would be well used and well loved as a place to make my favorite comfort food, GRILLED CHEESE! I don’t currently have a griddle. I would use this most often for my favorite comfort food, GRILLED CHEESE! Yum! This looks awesome and it would really cut down on my cooking time. Love how big it is and how it easily folds up. I would use to make breakfast for dinner! I like making pancakes for an easy dinner but the pan I use is so much smaller – the griddle looks like you can make a lot at one time. My family is big breakfast fans and after Master Chef Junior aired, my 9 year old daughter wants to be on the show…so she is an aspiring chef and pancakes is a fave breakfast staple of hers, she is starting to cook and the pancake griddle would be a huge help! I would love to have this. It would make cooking so much easier. I’m currently a college student and in a few months will be moving into a tiny apartment with an even tinier kitchen. My roommate and I would appreciate winning a griddle to make a good breakfast with so we can stop eating cereal everyday. Three words. Chocolate. Chip. Pancakes. (okay, one more!) Please! I recently dropped my griddle and broke it 🙁 My family would absolutely love this griddle. It is a great help for quick breakfasts before school. I love the fold up feature, since my kitchen is so small and does not have much storage. Thank you for giving us a change to win this! This would make weekend breakfasts so much easier! Eggs, pancakes, shallots and mushrooms all on one pan! The Presto griddle would be wonderful for family togetherness. My family will all be able to eat at the same time nice, crispy pancakes, my special favorite grilled garden eggplant, unfried green tomatoes, lemon dill fish fillets, hash browns, eggs, sausages, turkey burgers, hoe cakes, salmon patties, toasted buns. And of course grilled cheese and other hot sandwiches. My imagination is going into overtime. Another plus, for ease of the cook, is the non stick surface or the dishwasher option. Saves time and energy and my poor over washed care giver hands from caring for my elderly Mom that requires 24/7 care. I can even see being able to get off my feet for a few minutes to rest. I’m convinced, I neeeeeeed this griddle.